In the early evening of Thursday, March 28, students mingled with faculty and community members in the University Art Gallery for the opening of the annual Juried Student Art Exhibition. Susie Kantor, the associate curator of visual arts from the Yerba Buena Center for the Arts teamed up with Taravat Talepasand, department chair of painting from the San Francisco Art Institute to select 35 unique pieces of art submitted by students to display for the exhibition. On display through April 21, the exhibition provides a peak into the creativity and an opportunity for student work to be critiqued on a professional level. Rheannon Eisworth, previously featured in the Star as a student spotlight, is one of the many students displaying art this year. Presenting an acrylic painting, Eisworth integrated embroidery into the piece and displayed it on an embroidery hoop. Eisworth created her work with an idea of feminism. A fifth-year student double majoring in Art Studio with a paint concentration and Business, Eisworth hopes to continue her art after school. The art displayed varies drastically, from embroidery embedded paintings all the way to “Carson Hill Mine,” an archival inkjet photographic print submitted by fourth year art studio major Alexa Bolton. Excited to present her work, Bolton shows her creative transition from self proclaimed “tongue-in-cheek” photo collage pieces to the now displayed documentary style practice. As the exhibit is a very selective display, many student artists unfortunately did not have their work out for display this year. However two art students, and friends of Bolton, have taken it upon themselves to arrange a separate, student run “No Show” exhibition at the same time. Emily Murray, a fourth year Art Major and Art History minor, collaborated with fellow art student Ryan Patton to curate a small last minute show in the department office hallway just next door to the Juried Student show. 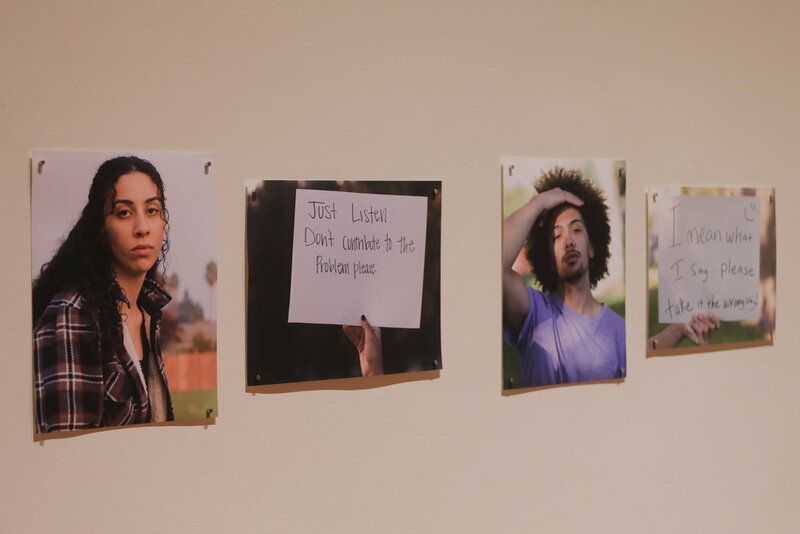 With no faculty involvement, Murray and Patton contacted those not admitted to the Juried show, and set about getting their work the recognition of the student body. “Ryan and I’s show wasn’t critiqued or judged, we had an open call for art and accepted everything that was offered to us. Our main goal was to present as much work as possible in an inviting way. We thought it would be a good curatorial challenge not to have a theme and it turned out to be an excellent body of work,” said Murray. Excited by the amount of work they were able to put up, Murray who has been published in “Zaum”, the student literary magazine, and soon to be in the “Studio Visit” national art magazine this summer is familiar and understanding of the selective nature of the show. With both shows offering fantastic and diverse displays of the Sonoma State artistic process, it is well worth a saunter down the decorated hallway. Engage with the artists themselves, and discuss the work that continues as a school tradition.